In 2015 we are barrelling towards a third world war at breakneck speed and much like the First and Second World Wars, oblivion to this trend is commonplace. From the complete resurgence of fascism in Ukraine to the overt funding and training of terrorism, to the rapid erosion of the planet’s health, crises around the world are converging into situations that affect of us. In the meantime what used to be real life has devolved into twenty-four-hour-a-day reality television. Most people do not care (or know) about Obama’s legacy as a warmonger and leader of the most war-hungry nation on earth; they do, however, praise his tweets to Caitlyn Jenner, and other shallow products of the western system of distraction. Whereas 2014 was one of the years in the 21st century in which the possibility of a third world war was reinforced as an inevitability, 2015 has become the year in which such a war is a matter of casual promotion by the mainstream press. The year 2016 looms on the horizon and with an American presidential election set to dominate it, the construction of fallout shelters is now an idea less absurd than that of any sort of peace under Hillary Clinton or Jeb Bush (or perhaps Donald Trump?). The United States is a nation whose supremacy relies solely on its projection of military aggression as a means of coercion and political manoeuvring. US national debt is difficult to comprehend when juxtaposed with its supposed status as a thriving, global superpower. While much of this military aggression has been disguised as humanitarian aid or democracy promotion, in reality it is the use of soft power as a means of colonisation and resource extraction. Programs such as Africom continue in their quiet recolonisation of Africa; meanwhile other US initiatives of ‘peace and democracy’ are loudly and violently bringing the world closer to war. The utter disaster of US-led western intervention in Ukraine has been so widely ignored by the mainstream press that, with the rise of any new Ukrainian crises, the response is guaranteed to be a one sided attack on Putin. To highlight the perpetual insanity of contemporary ‘Russia-blaming’ one need only peruse the openly biased articles of just a single writer from what passes as a news-site today. The fact of widespread Ukrainian fascism is something that the western media has gone from reporting (as recently as to outright ignoring when it became an inconvenient truth in the quest to destabilise Russia and seize control of Ukrainian resources. When Ukraine’s increasingly powerful fascist paramilitary group Praviy Sektor took the spectre of Ukrainian law into its own hands and became involved in a deadly shoot-out with Ukrainian police, western media described it as ‘Russian propaganda coming true’. This aversion to acknowledging the reality of the chaos in Ukraine and its western roots becomes understandable if one remembers that the NATO supreme commander has called for the ‘western group of nations as an alliance to engage in this informational warfare’ against Russia. Where does all of this white-washing and misinformation lead? I was reminded of one of the results while waiting for a lecture for a class entitled Cold War Europe 1945-1991 classmates were discussing how the effects of the cold war can still be felt today and the phrase ‘Putin’s Russia’ was continuously bounced around the room. Naturally I asked what they meant by ‘Putin’s Russia’ and the answers I received were synonymous with the daily headlines and hit-pieces that have been so expertly manufactured by a corporate media. Putin’s Russia according to the class was a place of medieval living standards with a failing economy, murder on the streets, and virulent, dictatorial propaganda. In response I asked what they thought of ‘Obama’s America’ with its perpetual unrest in response to police brutality, drone strikes, imprisonment of journalists, colossal debt and hugely disproportionate gap between the ultra-rich and the poor. What about ‘Abbott’s Australia’? ‘Cameron’s Britain’? And so on. The answers to these questions were of course that none of these could compare to Putin’s Russia. The obvious and occasionally infuriating problem that is encountered again and again is that while one can propose and defend actual facts with regard to why Russia is no worse and in many ways better than the west, my colleagues approached the topic with emotionally-charged yet factually-lacking ideas that have been shaped by the popular media and the ghost of Ivan Drago. If a war against Russia was announced tomorrow, their likely reactions would be of casual support. Perhaps now Russia could be gifted with what they believe to be democracy. In the midst of this global tension, it is admirable that Russian diplomats continue to call their western counterparts “partners”, but with a complete lack of reciprocity this is perhaps no more fruitful than Neville Chamberlain daftly conceding Europe to Hitler while proclaiming that he had achieved “peace in our time”. 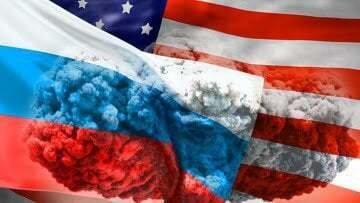 Russia and the non-western world will always be an ‘existential threat‘ to America regardless of whether the latter is under McCarthyism or McCainism. The purpose of the lackey mainstream media is to inflate such a fear by reinforcing the image of the bogeymen of ISIS and ‘Russian aggression’. To simply look one step further than what is presented as “The News” is to see the elaborate-yet-clear workings of an imperial mindset that is violently struggling to maintain power. One can only hope that more people will reject the conformity of manufactured fear and further reject the calls to war, because this time it will not be another Viet Nam or another Iraq. Now the entire world faces the consequences of a rabid aggression that has largely survived with the help of a morally bankrupt media.